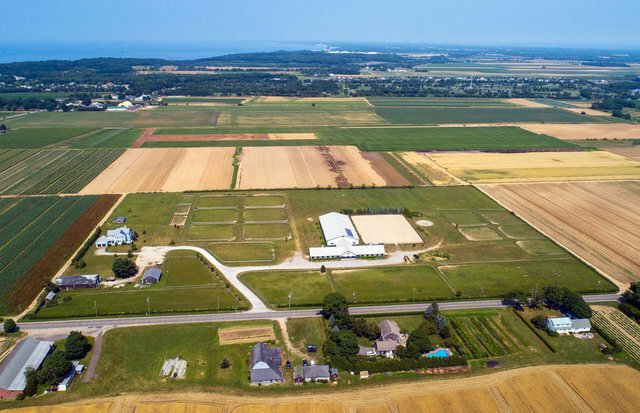 A premier equestrian facility, Willow Tree Farm sited on 21.5 +/- acres of bucolic farmland is conveniently located in the heart of the North Fork with a 360-degree view of pristine farmland and surrounding vineyards. Located minutes from organic vegetable farms, nurseries, orchards, vineyards and more. This is a true picturesque farm with a world class, top of the line equestrian complex built to satisfy the Grand Prix athlete, whether Dressage or Hunter Jumper, sparing no expense. The property is comprised of two separate lots, one a 17-acre horse farm with a 78'x185' indoor riding arena. The property includes three separate wells, and generator hook up (a 15hp well will fill up 1,000 gal. of water in less than five minutes, which can irrigate the entire property). The entire property has been excavated with top soil removed and re-sorted with sand to enable the use of large tractor/trucks during daily work and preventing the hassle of mud. There is plenty of convenient parking for boarders and room to spare. The Barn This barn boasts 24 individual 12x12 stalls. The stalls were professionally stripped and filled with packed & tampered sand, then installed with honey combed rubber thick mats along with anti-casting boards, a private window per stall along with individual water spigots with anti-freeze hydrants in each stall. There is a 12' cement aisle way, two indoor wash stalls with warm/cold water year-round with an overhead heat lamp system in each, a laundry room with washer/dryer, two large boarder tack rooms, separate feed room, office and a heated bathroom and a heated viewing room just off the indoor arena. There are stairs to the large hay loft that has a drop to each stall and room for more than a 53' tractor trailer load of hay. There are two outdoor wash stalls. The indoor arena welcomes the rider and horse with state of the art, travel right, dust free footing, surrounding mirrors, an insulated ceiling, and a stereo system throughout. The Barn has solar panels and is well lighted for night time riding and flooded with natural light through large windows and doors during the day, this indoor arena is ideal for the professional or amateur. Adjacent to the indoor arena, you will find a warm heated viewing room lined with a pine wood interior. The outdoor riding ring, meticulously created by a professional, is 220x160 with footing consisting of felt fibers and sand with ideal drainage and layout, allowing all year riding with the ultimate footing to satisfy any equestrian with a beautiful backdrop of landscaped trees. There is a Turf Hunt Course adjoining the outdoor ring and a 60' Round Pen. Turnout There are 25 fenced grass Paddock turnouts which enable rotation for grazing. There is one run in shed and plenty of room for more possibilities. 4.5 Acre Lot The second single and separate lot, which is potentially sub-dividable, is 4.5 acres with a 3,000 sq. ft. farmhouse included with solar panels, an open floor plan, three bedrooms and three and one-half bathrooms, gourmet kitchen with stainless steel appliances, stone counter tops and radiant heated floors, oversized first floor master bedroom connecting to a four-season porch also with radiant heat. Wood burning fireplace in the double height great room with walls of glass looking out to the paddocks and farmland, two car attached garage. Additional features include exterior Viking BBQ, lower level with 8 ft. ceilings, laundry shoots, laundry room. Separate three car detached garage, and large potato barn.